Booklet, “ “An Eulogy on the Life of General George Washington, Who Died at Mount Vernon, December 14th, 1799 .. Written At the request of the citizens of Newburyport ... by THOMAS PAINE, A.M.,” 22pp., Newburyport, Edmund Blunt, 1800, slightly loose at spine. 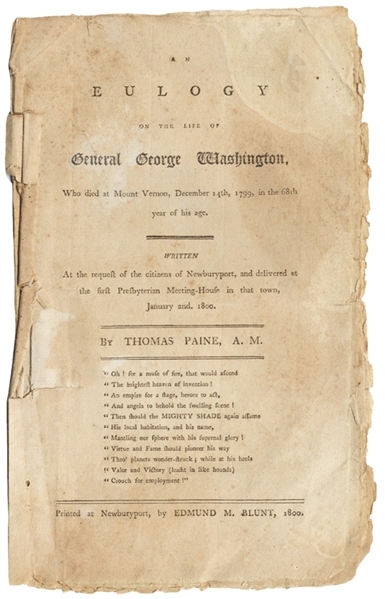 The eulogy was presented at the First Presbyterian Meeting-House on January 2, 1800. is an original printing of the eulogy text, printed by Edmund M. Blunt at Newburyport, 1800.